New Deluxe Heath Gourd Review: Hero or Zero? Heath products have a history of offering purple martin items that are eerily similar to existing products. 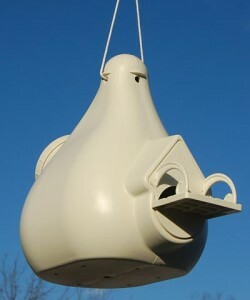 So, when we saw the new Heath Deluxe Purple Martin gourd, we were not surprised that it looked familiar. Heath also markets a hexagon shaped aluminum Purple Martin house that looks nearly identical to the trio castle made famous by the late J.L.Wade, made famous in the 1960′s by being the first manufacturer of mass produced purple martin houses. The new Heath Deluxe gourd seems to tic off some of the requirements of what purple martins need at first glance but a deeper dive gives us important info that we thought we should pass on. First, AND MOST IMPORTANTLY, the SREH crescent entrances are too large and WILL NOT keep out starlings! SREH entrances are a finicky thing. Just a hair off, and you might as well not even have them. These crescent entrances though crescent in shape serve no purpose, similar to other Heath gourds that tout an SREH entrance, but do nothing to keep out starlings. The access port in the back, makes its intended purpose, virtually impossible. How are you supposed to do a nest check with the access port at the back of the gourd? Quality gourds have the access ports on the side so a simple tilt of your body will allow you to have a full view of the contents of your gourd. These will only work if you plan on removing the gourd from your rack every time you do a nest check. The plastic is of unknown quality (made in China) and allows for lots of light and heat to enter the gourd. I am curious if the plastic has UV inhibitors (like a quality gourd does) to prevent the gradual break down of plastics that occurs when exposed to sunlight. The supposed owl guards pop off easily in your hand and if any body has ever seen a greater horned owl in all of its (three pound) glory, will know that hey would rip them off in short order. Not every thing is bad about these gourds. The depth is comparable to a Troyer vertical gourd, it has an outside AND inside porch, and the entrance height is correct. Also, the horizontal and vertical hanging/ventilation holes on the neck of the gourd make for convenient hanging options (if you are unable to drill a hole). Unfortunately for an item completely made and packaged in China, the 29.99 (on sale) price point is much higher than this item deserves. When you consider that the Troyer horizontal and vertical gourds sell for less, are better products, and are made in the states, it is hard to rationalize the added expense for a sub par product. We received NO compensation from ANY company for publishing this review.